Dodgers manager Joe Torre said he doesn't think suspended outfielder Manny Ramirez should be an All-Star this year, even though fans have him fourth in voting at the position. "No, I don't, and if you ask Manny, he'd give you the same answer," said Torre. "I understand a lot of it is a popularity contest and you want to give the manager the best players, but to me, the significance of the All-Star Game is to reward players who had a good first half." I agree; Manny hasn't done enough on the field. However, because of the stupid "this one counts" rule, Manny could (by some) still be considered a Top 3 NL OF. To channel my inner Herm Edwards: "YOU PLAY TO WIN THE GAME!" because this game counts...for some lame reason. The reason for this whole "Vote for Manny" thing is that the rules of the game are in conflict with each other. The fan vote (and while not relevant here, the mandatory representation rule) is made for an exhibition, but instead, the game counts. This is dumb. Profoundly so. If you want the game to count, fine, pick the Top 32 players via some other voting mechanism (fans/players/managers each having a 1/3 vote, perhaps?). But if the fans will continue to pick the starters, then it will remain, as it always has, a popularity contest. Smaller market guys or guys having an incredible first half will always be overlooked by the bigger market guys or established stars. And I haven't even yet touched the fact that a player suspended for PEDs is protected by the CBA and allowed to appear in the ASG. Talk about rules in conflict. Notice, too, that Torre said that Manny shouldn't be an All Star, not due to his suspension, but the lack of production, implied as a result of the suspension. "From the baseball aspect". Not "because he tested positive and was suspended for PEDs" folks. Then again, teams under Torre's stewardship don't exactly have a sparkling record, PED-wise, do they? So the PED suspension has no bearing on Torre's opinion. NONE. So why should WE let it bother us, too? WHY? Not saying it's right to conveniently ignore that little fact, but the eventual HOF manager Torre doesn't care much about it either. THE ENTIRE POSTING CAN BE FOUND HERE. Jay Bruce is more deserving of an All Star spot. The funny thing about it is, given what Manny did for them when he came over last year, if you're one who believes that the performance should be judged starting with the second half of last year (which I am; only counting the first half of every year in All-Star consideration seems silly to me), his performance does deserve it. I don't think there's any way there have been three outfielders more productive than him, even without those 50 games. So Torre has absolutely everything backwards. I'm not voting for Manny because I don't some smug guy on the internet to take the credit if he's in the top three. you cant be an all star if you miss 50 games of the first half regardless of the reason. 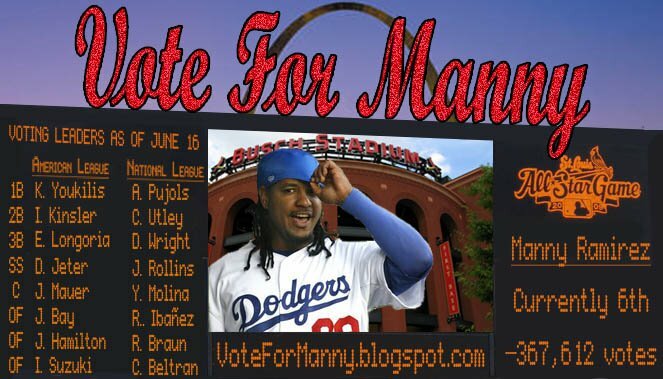 the "vote for manny" movement makes a mockery of the fan voting process. you should be ashamed of yourself. Anon 4:41: Thanks for the Herm Edwards catch. anon 11:44: I'm TRYING to make a mockery of the stupid selection process. Next time, try reading the rationale before commenting, ok? The all-star game has and always will be for the fans. If the fans elect him, than it is what it is. Now if the NL manager selected him as a reserve that would be absurd. Great blog. Thanks for sharing more than your ideas. Your enthusiasm came through and made me smile.